Post-1945, Ilford began selling a range of photographic accessories, presumed to have been sourced by their Amateur Products Division which, from 1957, handled the import and marketing of the ILFORD Sportsman cameras from the Dacora camera company of Reutlingen in Wurtenberg, West Germany. By the 1950 BJPA, Ilford, in their company advertisement, claimed "Ilford Accesories are available for almost every photographic requirement. Full details are available on application". Another web page illustrates and discusses Ilford's 35mm slide projectors. This page looks at the various darkroom enlargers marketed by Ilford for b&w printing. 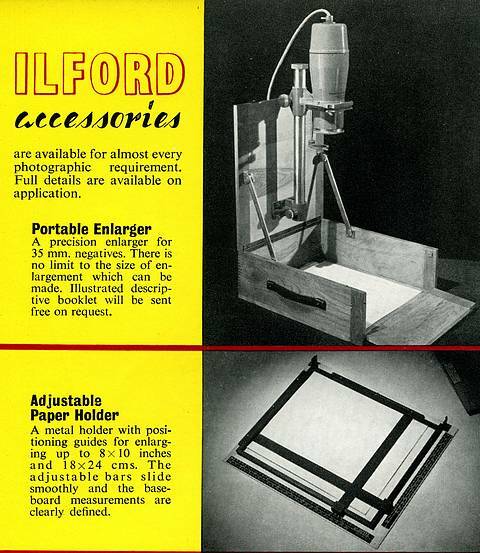 In the BJPA for 1950 (advertised in Amateur Photographer November 1949) Ilford illustrated a Portable Enlarger. It folded down into a wooden box for storage & transportation. It was made by Micro Precision Products (MPP) from around 1947 until 1952. 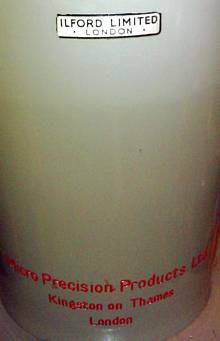 All early models were badged as MPP but from 1949 some were sold as Ilford enlargers, with an ILFORD LIMITED, LONDON, nameplate sticker on their lamp housing as well as red, embossed, lettering stating 'MPP Precision Products Ltd, Kingston on Thames, London', just above the negative carrier (see image below, right). Ilford described the portable enlarger thus: "A precision enlarger for 35mm negatives which has been designed for portability. It folds into a well-finished hardwood box, size 16½"x14"x6" and weighs 17lbs. It may be erected in three separate positions according to the size of enlargement desired. In the position illustrated, enlargements may be made up to 10"x12". (Other positions are show in the diagram). The normal lens equipment is the Ross Resolux 5cm f3.5, but an adapter will take the 2in Wray or Dallmeyer f3.5 lenses if preferred. Focussing is not automatic but easily and accurately done. The negative carrier is glassless and cannot damage the negative." Also shown (above) is the 'Ilford' Adjustable Paper Holder to hold bromide printing paper flat, in position and provide white borders. However, this couldn't have been used conveniently with the portable enlarger in position 1 (below, left) because its positioning on the enlarger's 'baseboard' would have been restricted by the vertical sides of the box (on 3 sides). 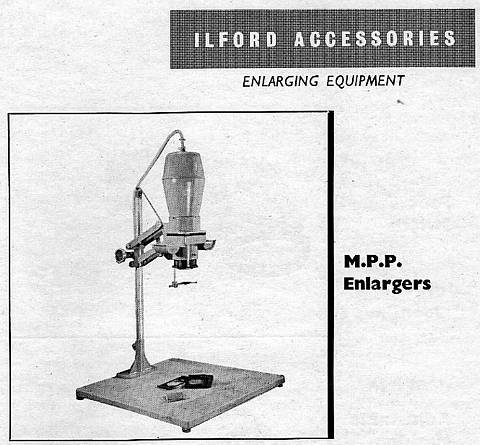 In mid-1955, Ilford included a full range of M.P.P enlargers in their catalogue, Models IE, IG & IP being for 35mm, ID, IR & IN Models being for 2¼"x2¼" negatives and Model 3 for 2½"x3½" negatives. General Specification of all models: The lamphouse takes a 75 or a 100 watt bulb which may be adjusted vertically. A double condenser incorporates a heat filter, and an orange swing-out filter is fitted for paper positioning. For focusing the enlarger head moves easily on the column and may be locked in the approximate size position; final focusing is then obtained by rotating the lens mount. Baseboards are of steel-reinforced hardwood. Spare lens thread adaptors: 7s. 3d for all models. Lenses: By Ross, Dallmeyer and Wray can be supplied. A lens thread adaptor is supplied for lenses other than Ross and the Wray 4¼ in. Prices as for the Envoy enlargers, above. 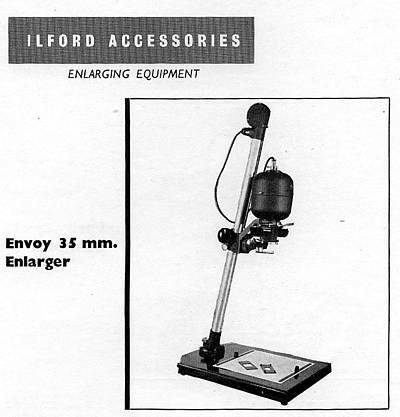 The 1954 BJPA has an Ilford advert showing the Envoy Junior Enlarger. Bill Smith e-mailed to say "I knew the Envoy people very well. 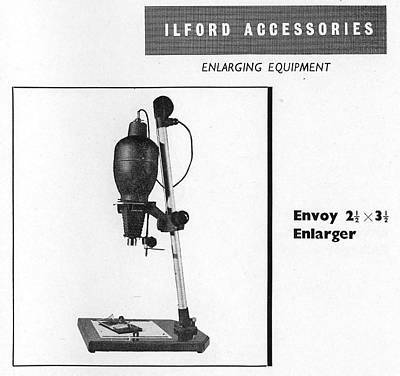 Ilford sold their wide-angle camera mainly to industrial outlets but the big seller from Envoy was their enlarger. 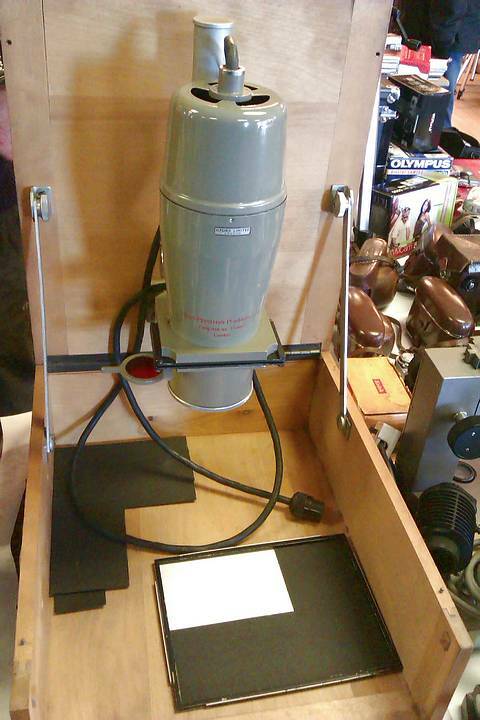 It was generally thought to be the best enlarger for the amateur market. The Envoy works in Handsworth, Birmingham (UK) was a very dingy little upstairs workshop and they did wonders in producing any precision products at all! I often visited them." This new enlarger contains a number of rather original features in its design, and some of its parts are made from unusual materials. Basically the Envoy Junior is a perfectly conventional instrument for negative sizes up to 2¼ x 3¼in and is supported on a plywood baseboard sized around 17 x 15in. The flange which supports the column on the base board does not surround the column in the conventional fashion, but is only a half tube. The column is secured to this by a large size bolt fitted with a wing nut. The column is a 30in length of extruded aluminium tube 1¾in diameter, and finished by anodising. The basis of the enlarger head itself is a light alloy casting which forms the bottom of the lamphouse and the negative carrier. This unit is supported from the column by a cast alloy bracket. The lens panel is carried by two parallel rods, but in contrast to the usual system whereby the lens panel slides up and down the rods, the panel in this case is firmly fixed to their lower ends. The two rods then slide in and out of the main head casting and project into the lamphouse. This method gives a larger bearing surface at the point at which the sliding motion takes place, and also enables a very novel focussing movement to be used. Fixed at one end of one of the rods with a tension adjustment is a thin steel stranded wire. This wire runs down the rod and is fixed at the lower end to the lens panel. At right angles to the two support rods within the head casting is a shaft which carries on its right-hand outer end a large knob. The portion of this shaft which is within the lamp-house carries a fairly coarse thread, and one turn of the wire which runs down the support rod is taken round this shaft and in turn grips the thread. Thus when the knob at the end of the shaft is turned the lens panel is moved up and down smoothly and quite without any backlash. This is quite the best and simplest focussing movement we have encountered on an enlarger of this pattern. The bellows are circular in section and are moulded from black rubber. The negative carrier, too, is a rubber moulding, and the design is such that the weight of the upper glass may be taken off the negatives in order to move the strip along. The film cradles are made from blue flexible polythene. 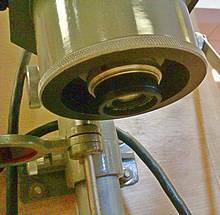 The enlarger is supplied with a flashed opal diffuser, and if desired condensers can be obtained for 35mm., 2¼in. sq. and 2¼x3¼in. negative sizes. The head casting is so made internally that the two condensers which are used for the largest size negatives are simply fitted into suitable lugs which are cast internally. For the two smaller sizes of negative, adapter plates are used to support the smaller size condensers. The lamphouse is a light metal spinning which is finished, like the head casting, the bracket, the column flange, and the lens panel, in blue hammer lacquer. The enlarger is pleasant and comfortable to use, the focussing action being particularly good. The price of the basic enlarger, without lens or condensers is £10 10s. 0d. plus £3 8s. 3d. purchase tax. The pair of condensers for 2¼ x 3¼in. negatives cost £2 14s. 0d., the set of condensers and an adapter plate for 2¼in. sq. negatives cost £3 12s. 6d., and the condenser and adapter plate for 35-mm. cost £1 13s. 6d. Panels can be obtained for a wide range of lenses from manufacturers such as Dallmeyer, Taylor, Taylor & Hobson, Ross, and Wray. Between 1954 and perhaps 1955, the Envoy Junior was renamed the Envoy Universal and was increased in price to £17.19s.4d (£17.97p), still without lens or condensers, a substantial increase over the price of an Envoy Junior and one wonders if the name change was to make this substantail price increase more palatable. In Ilford's 1952 General Catalogue, Section 8-B: Accesories for Professional Photography, shows two other Envoy enlargers, one designed specifically for 35mm and one for 2½"x3½" negatives. See below. A 35 mm. 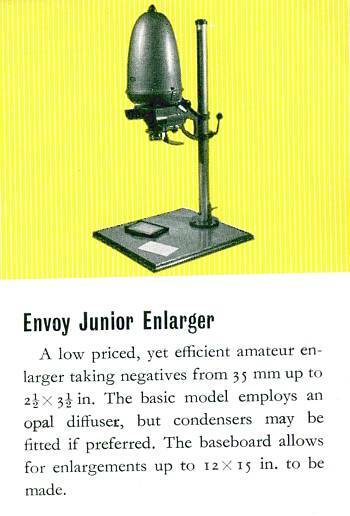 enlarger similar to the 2½ x 3½ model, but with the following variations. Projection Head : A 60-watt bulb is used and focused through a single spring loaded condenser. The head unit may be positively indexed at right angles to the column for horizontal projection. Film Carrier: Of transparent red plastic so that film sequence numbers are visible. Film is held only by the perforated edges. Lenses: Ross, Dallmeyer and Wray lenses may be used, the 5 cm. giving 18 diameters enlargement. Prices shown below. A vertical enlarger for negatives up to size 2½ x 3½ in. Enlarger Head: The lamphouse holds a 100-watt universally adjustable lamp, The optically worked condenser is of the double plano-convex type and built-in negative masks minimise light scatter. Two types of negative carrier are available - with and without glass, in sizes 35mm., 2¼in. square and 2½ x 3½ (6x9cm). A friction drive makes for smooth and easy movement of the spring-loaded enlarger head on the column, and fine focusing is obtained by a small hand wheel, which operates the leather bellows. Lenses: Lenses by Ross, Dallmeyer and Wray are available, the 4¼in lens giving 7¾ diameters enlargement. For prices see above. In the 1955 Ilford Photographic Material General Catalogue, p177, there are two enlargers of the type illustrated to the right, named as Vanguard Enlargers (Kamm) Models 2 & 4. I'm not certain who made these. The Model 4 cost £155 and was suited to negatives up to half-plate in size (as the item illustrated). David Stephens has e-mailed with details of an enlarger marketed by Ilford (?, see Footnote), post-1965 and almost certainly not beyond 1970. "I acquired this enlarger in 1967 or early 1968; I'm not sure exactly how or where (it was a surprise and very welcome sort of present). I've never seen another one quite like it here in the UK and don't remember having a box with it or I would have used that for storage. The maker's plate has both the Ilford and Fujimoto marks on it and it came with a Fujimoto E Lucky 3 element 50mm F/4.5 lens of very indifferent quality but fortunately it had a standard 39mm x 26tpi thread, so alternatives could be used. I replaced the lens and used it for many years, but purchased an alternative enlarger when I started using roll film. From what I remember the cost at the time was similar to the Zenith suitcase enlarger, although that had a slightly better lens and a filter drawer. This Ilford Fujimoto seems to have been aimed at a similar market. Both could be stored in a similar small amount of space." David shows below how, despite not having the original storage, the Ilford Fujimoto could have been dismantled and packed away neatly. The enlarger was manufactured by the Japanese company Fujimoto and badged as an Ilford enlarger, complete with Ilford's 1965 'sunburst' symbol. Alongside the 'sunburst' and 'ILFORD enlarger', is the information 'Made In Japan' above the trademark of Fujimoto Photo Industries Co.Ltd (see picture, left). Fujimoto was founded in 1913 and became established as Fujimoto Mfg Co in 1933. It began production of cameras in 1934 and the production of enlargers in 1935. All activity stopped in 1945 (the end of WW2) but in 1950 it was revived as Fujimoto Camera Mfg Co. It very soon dropped the production of cameras and it became Fujimoto Photo Industries Co Ltd in 1966. Fujimoto became part of the Tokina organisation in 2008 when Fujimoto Photo Industrial was purchased and started operations as an affiliate. Tokina is now part of Kenko Tokina Co., Ltd; since the 2011 merger of Kenko with Tokina. For comparison: A Zenith UPA-5 autofocus enlarger packed away in its 'integral' suitcase (the case lid's outer surface was also the enlarger baseboard). David continues: "Oddly, while most of the constructional threads are M4 or M6 metric, the chrome steel column is 1.125 inches diameter but 45cm long, and the plywood baseboard is 13 inches x 16 inches, covered with poor quality plastic laminate. The head is secured to the alloy arm by a 1/4 inch 20tpi thread which allows its use as a copy stand, either directly or by rotating the head from vertical to horizontal  but the lamphouse falls off if you try that, although it has locating studs. If you want larger than 10 x 8 inch prints you have to turn the column around (and project onto the floor) or find some way of securing the lamphouse when its horizontal." "The crackle paint and chrome have proven pretty durable and the whole item still works smoothly. Although the bellows are still light tight, they now look a bit sad from 20 years of neglect in a damp cellar. It was obviously quite well made. If not the most rigid or robust, it was adequate and no worse than it's competition at the time. Construction is mostly bent and pressed steel plate, apart from castings for the arm and baseboard socket and a bakelite type plastic vent on top of the lamp housing. The bulb holder is thankfully ceramic. The illumination is even, although not outstandingly bright  typical of many enlargers at that time. It has a standard double condenser system, the upper lens being a larger diameter 2¾inch, the smaller lower lens being 2½inch, positioned about ¼inch above the top of the negative carrier in a ventilated housing. The lamp house must be astoundingly dust proof as I've never really needed to clean the condenser lenses. The lamp isn't adjustable for height but doesn't seem to need this to get even enough illumination - corners are about ¼ stop down. The lamp holder also has ventilation judging by the light leakage, but has no air intake that I've found, so it gets hot. When I first acquired the enlarger, it had a peculiar 100W 'E Lucky' mushroom bulb - which still works although I've put in a P3/3 (e.g. a Philips Photocrescenta) and retired the original. There is no filter drawer. The glassless negative carrier (see below) appears to be able to take clip in masks but I haven't seen them, which, with the lack of a box, makes me think it was a demonstration model or sample at some point in it's life. Ilford were pulling out of Mobberley and moving staff to Essex in the late 1960's early 1970's, so who knows how serious an attempt this was to place a product in the hobby market against the rising tide of imports. Couldn't even really claim 'I'm Backing Britain' (a brief patriotic campaign which flourished in early 1968, aimed at boosting the British economy) with this one could you?" Footnote: Could this be a 'one-off' marketing trial of an item that never went into full scale distribution ? Maybe one of a sample run that was subsequently sold off to a dealer.